Videos which contain images of the Earth taken aboard the International Space Station are usually time-lapse Notes 1, but this amazing HD video below, titled “Orbit” shows a complete orbit around Earth from the ISS in real time. A breathtaking 92-minute and 39-second show of the beauty and majesty of our planet from 250 miles (400 km) above. Orbit is a real-time reconstruction of time-lapse photography taken on board the International Space Station by NASA’s Earth Science & Remote Sensing Unit. The structure of the film is built around a nested selection of Phaeleh’s last three albums; Lost Time, Illusion of the Tale & Somnus. The tone & pacing of each track influenced the choice of material used. Typically, each time-lapse sequence was photographed at 1 frame per second. Each sequence was processed in Photoshop. A dirt map was made in order to repair dust, blemishes and hot pixel artifacts that would otherwise confuse the re-timing phase of the workflow resulting in strobes and distracting blurs. Image processing techniques were used to emphasize features on the Earth’s surface. Every sequence consists of a number of layers that when masked, processed & blended correctly produce the final look of each shot. The length of the film is exactly the length of time it takes ISS to orbit the Earth once, 92-minutes and 3- seconds. Seán Doran, February 5th, 2018. The ISS maintains an orbit with an altitude of between 330 and 435 km (205 and 270 mi) by means of reboost Notes 2 maneuvres using the engines of the Zvezda module Notes 3 or visiting spacecraft. It completes 15.54 orbits per day. “Orbit” shows a complete orbit around Earth from the ISS in real time. 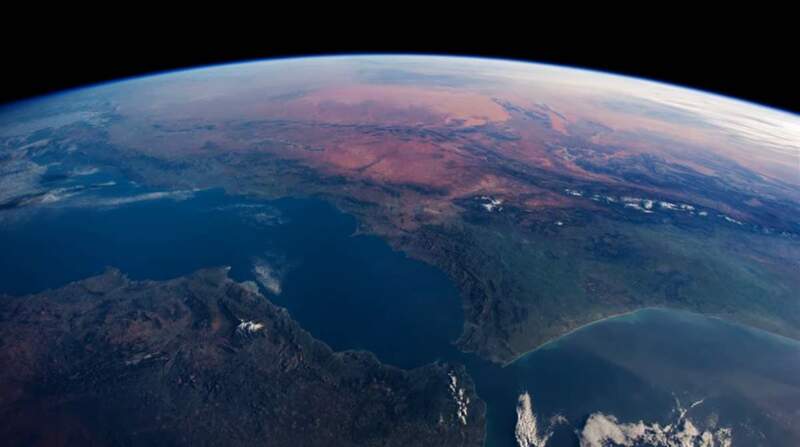 It is a real-time reconstruction of time-lapse photography taken on board the International Space Station by NASA’s Earth Science & Remote Sensing Unit. Time-lapse is a photographic technique of taking a sequence of frames at set intervals to record changes that take place slowly over time. When the frames are shown at normal speed the action seems much faster. Reboost is the process of boosting the altitude of an artificial satellite, to increase the time until its orbit will decay and it re-enters the atmosphere. Zvezda ( meaning “star”), also known as DOS-8, is a Service Module on the International Space Station. Early in the station’s life, Zvezda provided all of its critical systems. It made the ISS permanently habitable for the first time, adding life support for up to six crew and living quarters for two. Zvezda’s DMS-R computer handles guidance, navigation, and control for the entire space station.